In recent years, network engineering has become much more challenging. Most European research networks are offering light paths, dedicated network connections with guaranteed quality of service. With the advent of these new network services, researchers are demanding light paths across the globe that cross many administrative networks. Network engineers must keep track not only of changes at the IP layer, but also of daily changes in the underlying circuits. What is more, the properties of other networks become relevant for the operation of these circuits. For path finding, it is necessary to have the details of different encodings in order to avoid incompatibilities in a path. Finding the shortest light path is highly nontrivial, and a recent study shows that shortest paths can even contain loops. This counter-intuitive behaviour is caused by incompatibilities between different networks that force the shortest path to include network domains that can convert between different encodings. Exchanging information about encodings and topologies between network domains is essential for path finding. Monitoring existing connections can be cumbersome, as failures in one domain may propagate through other networks, while it is unclear in which domain the failure originated. Traditionally, network operation centres have used dedicated software to manage their own networks, and relied on phone and e-mail to exchange details about their network with associated networks. This approach no longer works for present-day research networks that offer light paths to their users. Automated exchange of topology and state information between networks is necessary. The network description language (NDL) is a schema that allows domains to describe and exchange information about their networks. It was developed by the University of Amsterdam within the Dutch GigaPort project. The main selling point of NDL is that while it allows for a precise interoperable description of the network topology, it also permits the individual networks to control the exchange and confidentiality of information. Networks are traditionally represented as graphs, with nodes that represent either devices or whole domains. NDL deviates from this simple model and provides a much richer schema, which allows the description of devices, interfaces, domains, adaptations and more. The inclusion of adaptations allows explicit descriptions of multilayer networks, including hybrid networks that combine technology such as Ethernet, SONET (Synchronous Optical Network) and WDM (Wavelength Division Multiplexing) in the same infrastructure. Research networks are collaborating to make both practical and formal agreements on the exchange of data. 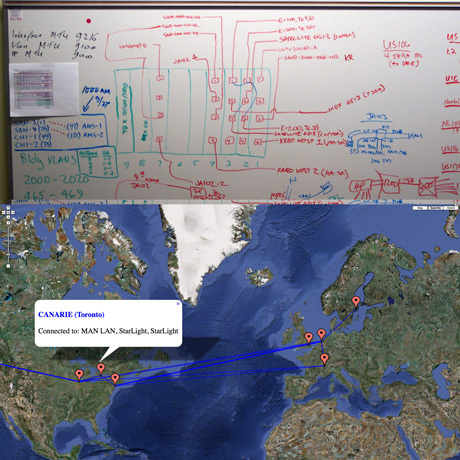 The Global Lambda Integrated Facility (GLIF) provides an informal platform to agree on procedures, while the Open Grid Forum (OGF) provides a more formal platform to standardize data formats and protocols for information exchanges. Developers of NDL contribute to the Network Markup Language workgroup (NML-WG) that standardizes a data format for topology description. Other contributors include developers of the perfSONAR monitoring software, developers of the common Network Information System (cNIS), in use at the European research network GÉANT2, and many others. Figure 1: Currently, engineers use whiteboards. With NDL, topologies will be automatically generated. Source: J. van der Ham. The University of Amsterdam (UvA) and the Dutch computing centre SARA have developed preliminary tools based on NDL. Some of these tools are shown in the figures and are in use for the Dutch research network SURFnet 6, as well as by international network exchange facilities such as NetherLight in Amsterdam. In SURFnet 6, network engineers must deal with a number of databases to perform their tasks, including an incident ticket database, fibre database, configuration management database and customer database. Many of the data between the databases overlap and some tools, such as path finding, use information from multiple databases. The goal of NDL is to allow easy integration of the data, while each tool still maintains its own data. Besides collaborating on a formal standard that incorporates the best of all contributions, SARA and UvA continue to build open-source tools for managing their networks. One of the future goals is to integrate network information with data and computing resources. This should allow grid schedulers and video applications to provide users with optimal performance, taking computing, storage and the network into account.